Stantoncavaliers.site is a scam website. These scammers create fake websites and then pay to advertise them online using stolen credit cards. This is not a review, they are criminals! Stantoncavaliers.site is not a puppy breeders website and this is not a review of Stantoncavaliers.site. This is a warning. 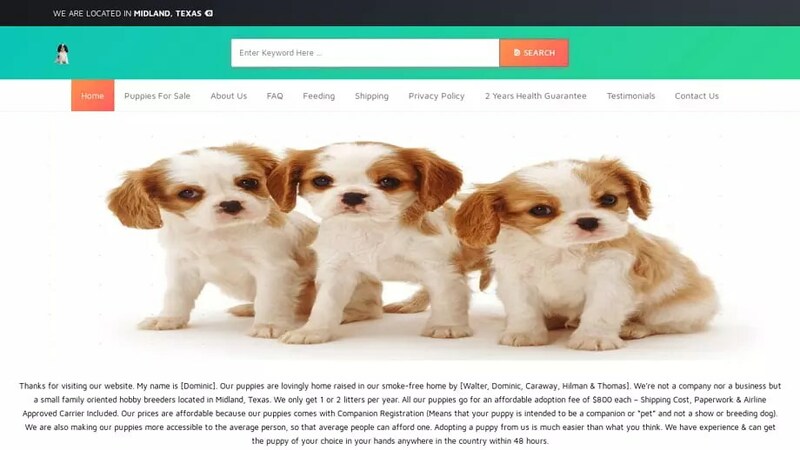 Stantoncavaliers.site will claim to deliver the puppy using a Fraudulent Delivery company. Stantoncavaliers.site was registered on March 13, 2019 with NameCheap, Inc. .
Stantoncavaliers.site was registered using the email address [NOT KNOWN]. Stantoncavaliers.site was registered with the domain registrar NameCheap, Inc..
To send an abuse report to NameCheap, Inc. please click the red button below and complete the email to help shut down Stantoncavaliers.site!